WATERVIEW of pond! 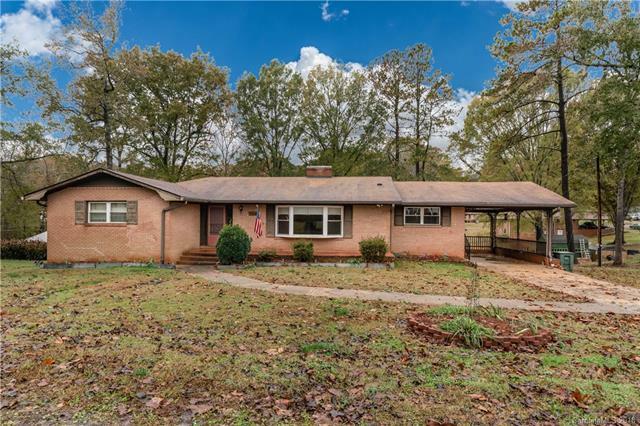 Charming, All-BRICK Ranch home with basement on 1+ acre lot with stream in the backyard. Covered front porch w/view from the bay windows in the family room as well as a fireplace. Large, eat-in kitchen with breakfast bar, and built-ins in the dining area. Great counter/cabinet space! Huge master bedroom w/ wood floors and ceiling fan. Master bath with tub/shower combo & extended vanity. 2 more bedrooms & a full bath on the main level. Open porch. Semi-finished walkout basement (non-ducted has electric heat & wall unit AC. Multi-purpose/workshop/storage rooms in basement, 1383 sq feet. Private well & septic tank/system. 1-car carport on main level. Pond right across the street! Sold by Re/Max Leading Edge. The data relating to real estate on this Web site derive in part from the Carolina Multiple Listing Services, Inc. IDX program. Brokers make an effort to deliver accurate information, but buyers should independently verify any information on which they will rely in a transaction. All properties are subject to prior sale, change or withdrawal. Neither RE/MAX Impact Realty nor any listing broker shall be responsible for any typographical errors, misinformation, or misprints, and they shall be held totally harmless from any damages arising from reliance upon this data. This data is provided exclusively for consumers' personal, non-commercial use and may not be used for any purpose other than to identify prospective properties they may be interested in purchasing. © 2019 Carolina Multiple Listing Services, Inc. Data last updated 2019-04-25T07:58:49.933.